Quentin Tarantino's Inglourious Basterds is being investigated by the advert censors over complaints about the film's posters. The title was always going to have a hard time with censors, even with its incorrect spelling. Cynics believe it was done so it wouldn't have problems during its advertising campaign. However, that doesn't seem to be the case. The Advertising Standard Agency (ASA) has received complaints from the public over the adverts, which features the 'controversial' title and swastikas emblazoned on the posters. The general nature of the complaints is that the ad is offensive and unsuitable to be seen by children, said an ASA spokesperson: We are currently looking into the complaints and establishing whether there are grounds for an investigation. Curiously, there are several posters dotted across the UK that have either the second part of the title absent or the words The New Film by Quentin Tarantino in place of Inglourious Basterds. TV ads have followed suit, with no mention of the full title pre 10pm. By comparison, advertising in the US is free to use the full film title, Inglourious Basterds on TV and poster campaigns. A poster and radio ad for the film Inglourious Basterds. a. The poster featured an image of three men holding guns and a knife. b. 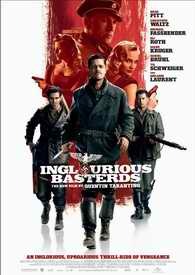 The radio ad featured sound clips from the film; the voice-over stated Quentin Tarantino brings you his most inglourious, most wildest adventure yet, utterly glorious ... Inglourious Basterds in cinemas Wednesday. Issue 1. Six complainants objected that the word basterd was offensive and inappropriate for display on a poster or where it could be seen by children. Issue 2. One listener objected that the word basterd was offensive and inappropriate for broadcast when it could be heard by children. Issue 1. Not upheld. The ASA considered that although the word basterd would be considered distasteful by some, it was presented in the context of a film and was not used in an aggressive or derogatory manner or used to verbally attack someone. Because the word was presented in such a way as to make it clear that it referred to a film, and care was taken in its placement to mitigate its exposure to children, we considered that it was unlikely to cause serious or widespread offence, or be seen as socially irresponsible. Issue 2. Not upheld. We noted the steps Universal had taken to ensure that the radio ads were scheduled in such as way to avoid times when children were most likely to be listening. We considered that the ad was unlikely to be of particular appeal to children and, because it was clear the word referred to the title of a film, we concluded it was unlikely to cause serious or widespread offence or harm children.